Peel shrimp removing tails and rinse. Set aside. 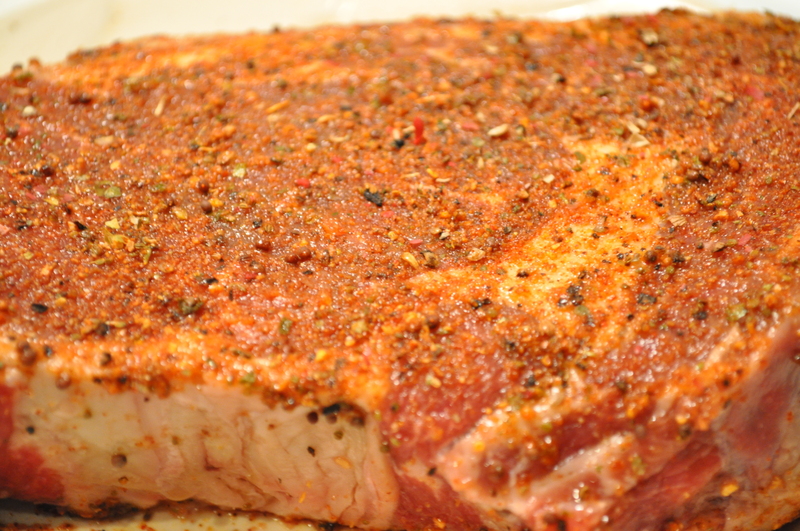 Season the steak with a bit of olive oil, sea salt & pepper, and steak seasoning. I used Chicago Chop and Steak Seasoning. Set aside. Pre-heat grill. 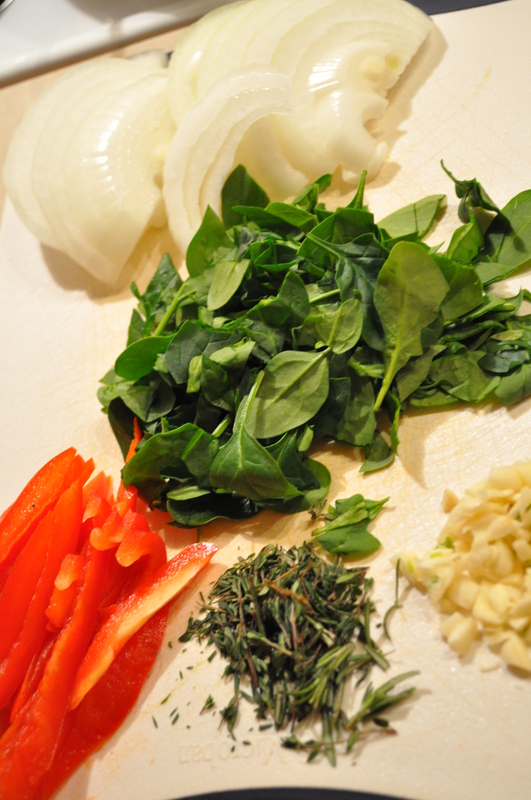 Slice the onion and pepper, chop garlic and herbs, and rough chop the spinach. Set aside. Place steak on grill and cook to your liking. I cooked mine medium-rare, probably more on the rare side. You don’t want it too done because you’ll add it to the hot shrimp mixture later and it will cook a bit. Once it’s off the grill set it aside to rest. 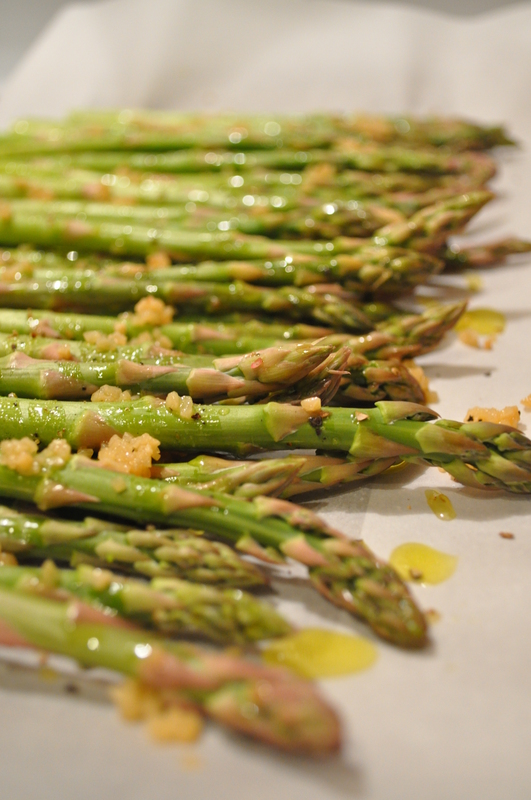 Line a baking sheet with parchment paper and prepare the asparagus by trimming the ends. Drizzle with olive oil and about 2 Tbsp. of chopped garlic. Sprinkle about 1/2 Tbsp. of sea salt and about 7 grinds of pepper. Roast for 20-25 minutes at 400 degrees. While the asparagus is roasting, thinly slice the steak and set aside. 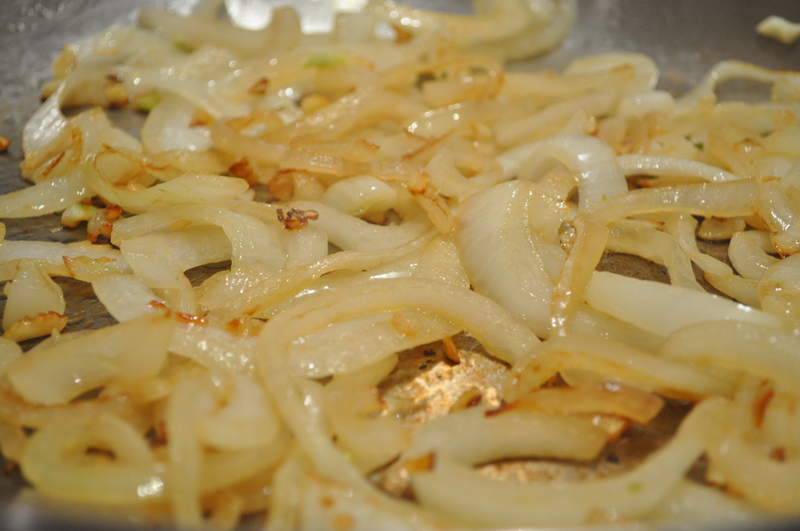 Drizzle olive oil in a skillet and saute onions and garlic on medium to medium-high heat until lightly golden. During this process, boil your pasta water. Cook pasta according to package directions (15-16 minutes) and drain. Once the onion and garlic are a light golden color, add the red bell pepper and cook for 5 more minutes. 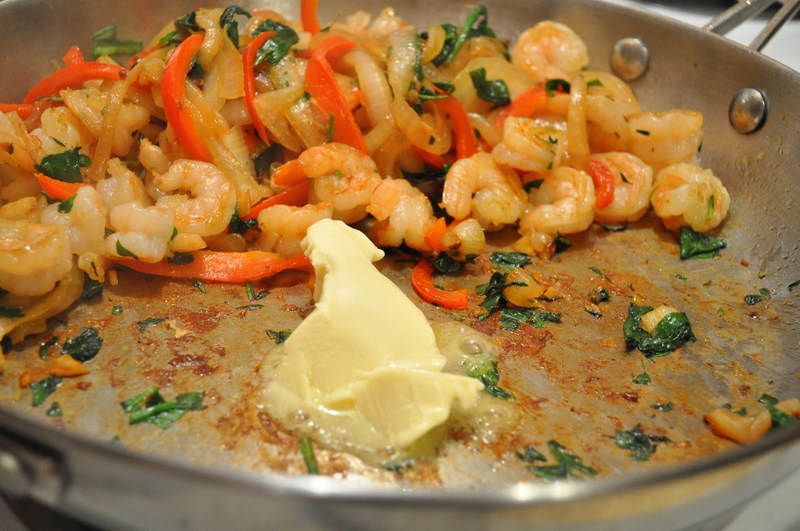 Add shrimp, spinach, herbs, and season with about 1/2 tsp. sea salt. 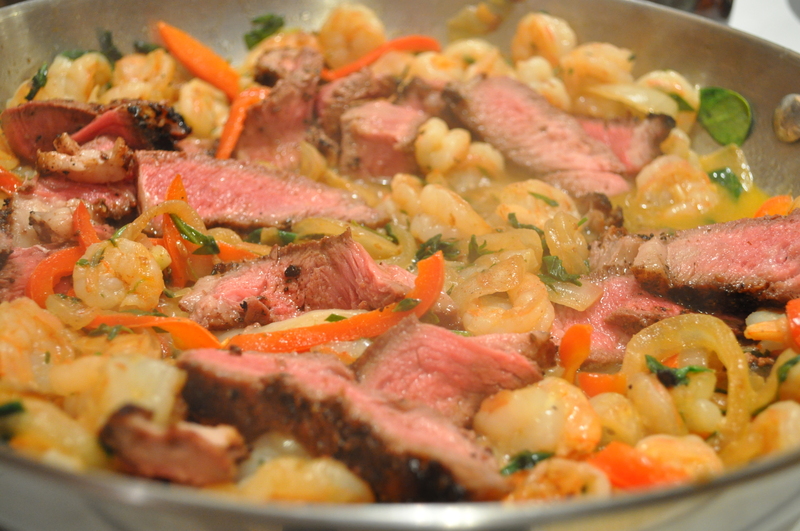 Saute until shrimp are almost cooked through. Slide mixture to the side and add butter, scraping the bottom of the pan. 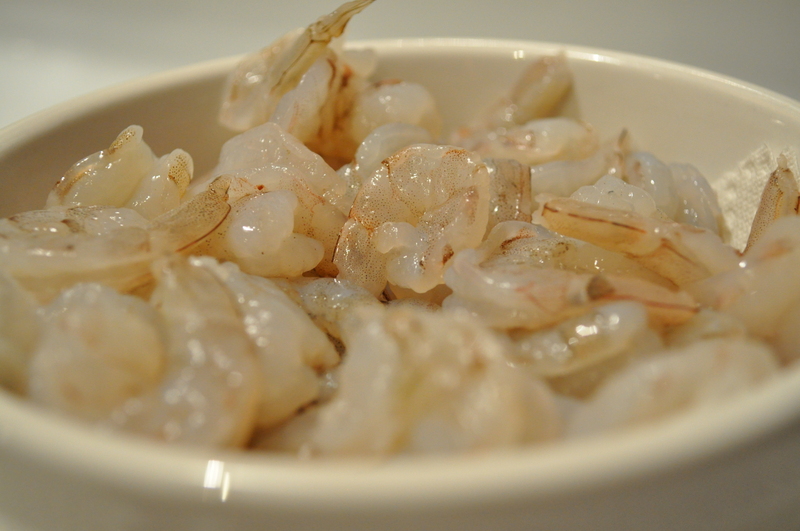 Next, add about 3/4 cup wine, de-glazing on medium-high until shrimp is cooked through. Remove from heat and add steak, tossing carefully. 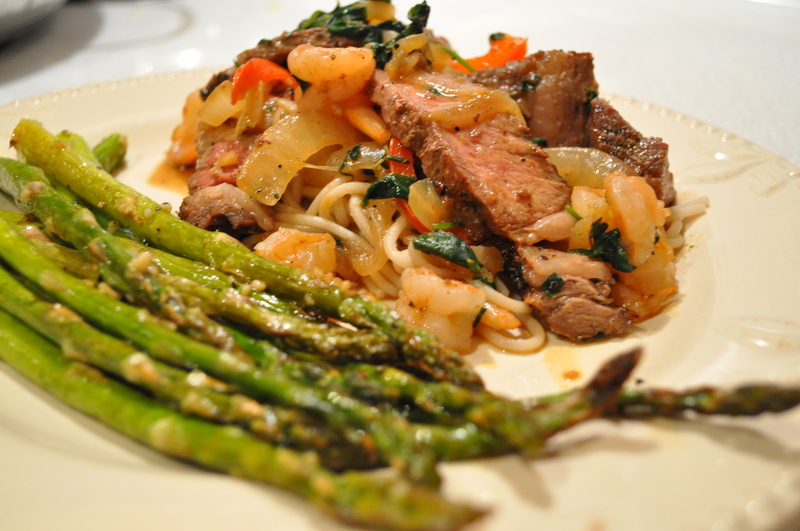 Taste, season a bit more if necessary and serve over pasta with the asparagus on the side.